For a pursuit that is all about freedom and individuality, the world of custom motorcycles can be a strangely serious business. Are those tires good enough? It’s a hardtail, it can’t possibly handle. What, only 50 bhp pulling 200 kilos? Like audiophiles who’ve become so obsessed with hi-fi equipment that they cannot enjoy music any more, our world has its share of prescriptions and purists. 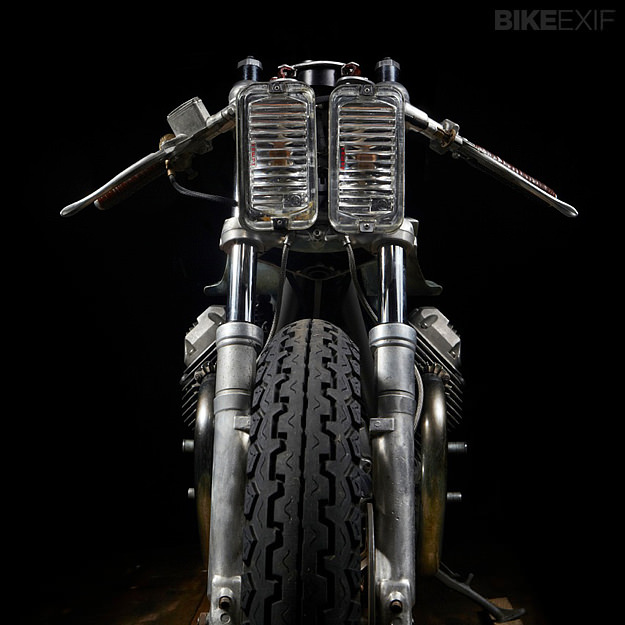 El Solitario is the antithesis of that mindset. The Galician workshop marches to the beat of its own drum, building and riding motorcycles for the sheer fun of it. It’s an approach that has made this collective of mechanics and artists one of the most controversial custom builders in the world. It’s also attracted attention from the big hitters in the moto media—from Cycle World in the USA to the Japanese magazine Moto-Navi. 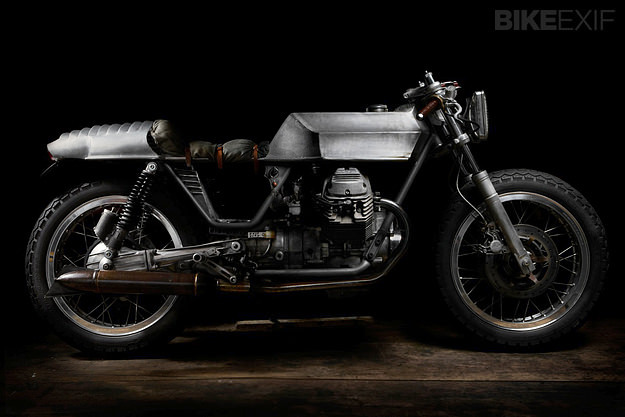 This Moto Guzzi V65, nicknamed Trimotoro, is the closest thing El Solitario has to a ‘shop bike.’ It’s been a long time in the making—around 800 hours, they calculate. But much of that time has involved riding, fettling, and just plain enjoying the bike. The name Trimotoro comes from a vehicle in an obscure children’s book. 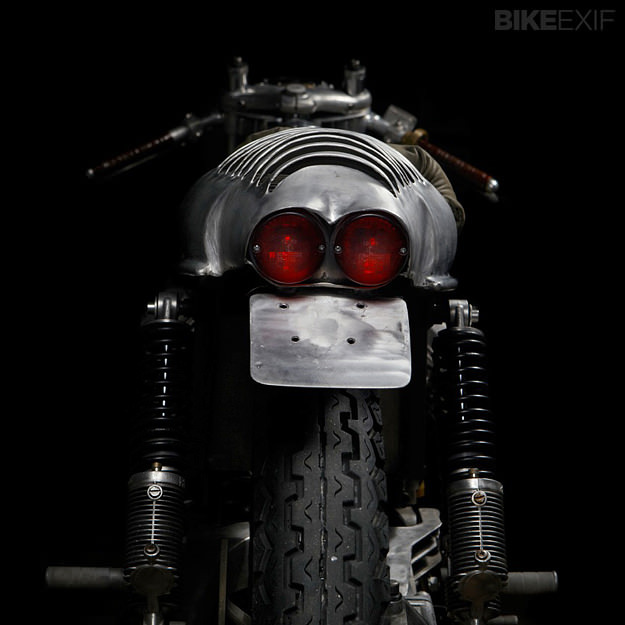 Mechanically, this V65 is in excellent shape: El Solitario gave the Guzzi a complete mechanical overhaul and rewire, and blueprinted the 650cc air-cooled motor. New Dell’Orto PHBH 30mm carbs were fitted, and now breathe through velocity stacks. 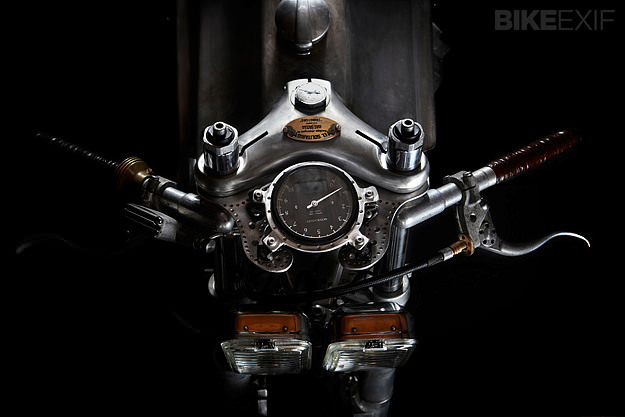 The exhaust is a modified vintage BMW system, and the electrics were given a solid jolt with an AntiGravity li-ion battery, Ducati Corse coils and a Silent Hektik regulator. The V65’s forks have been lowered a little (in V50 Monza triples) and Marzocchi shocks are fitted at the back—which now boasts a Monza swing arm too. Dunlop K81 tires ride on aluminum Akront 3.5 x 18” rims. It’s the appearance that immediately grabs the onlooker, though. The headlights are from Lumax, a commercial lighting fixture specialist. 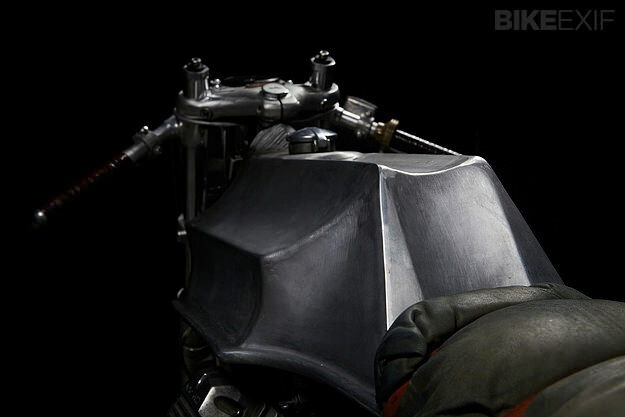 The bodywork is hand-made, beaten from raw metal. 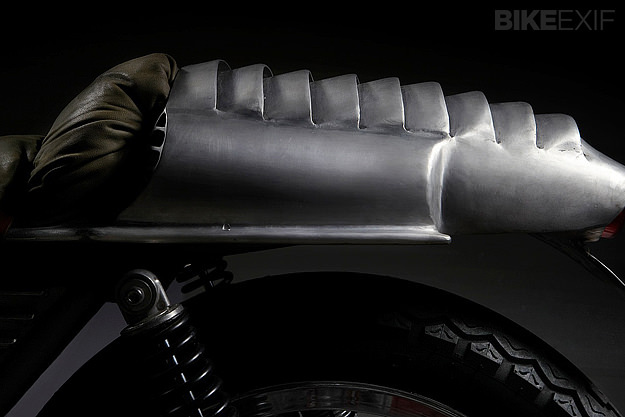 The seat—yes, it’s strapped on with leather belts—is made from Nappa leather. The clip-ons are solid aluminum items from Magura, with the levers and throttle coming from Kustom Tech. The grips are hand-made from shellac. Trimotoro won’t out-drag a GSX-R. But I’ve followed it while riding a Ducati Monster, and it maintained a more-than-respectable pace. Best of all, it put a smile on the face of all those who saw it or rode it. And isn’t that what it’s all about? Head over to the brand new El Solitario website for updates and a fine online shop, or follow their exploits via the ESMC Facebook page. Images courtesy of Kristina Fender.